Just after San Francisco approved a preferred design for its first Bus Rapid Transit route on Van Ness Avenue, the SF County Transportation Authority showcased the latest conceptual proposals for a companion BRT project on Geary Boulevard. Geary BRT, which has been fraught with delays over the years, is expected to bring relief to riders on Muni’s notoriously sluggish 38-Geary line by significantly improving transit reliability and speeding up trips by as much as 30 percent. The 38 follows Muni’s first streetcar route, traversing nearly the entire length of San Francisco from the Transbay Terminal to Ocean Beach. With 50,000 daily riders, it is the city’s busiest bus line. The BRT upgrade is expected to further boost ridership on the corridor, which carries as many travelers by bus as it does by car, according to SFCTA project leader Chester Fung. Geary BRT would speed up trips with features like dedicated bus lanes, off-board ticket machines, signal priority for transit, low-floor vehicles, and upgraded shelters. While all buses could potentially use the transit lanes, BRT buses would run as the 38-Limited and pass local buses in designated areas. Fung said planners are determining exactly which stops BRT will serve. The project will also include pedestrian safety improvements like sidewalk bulb-outs, and a number of left turns off of Geary may be banned. These improvements have been a long time coming, with the project already delayed by four years. But SFCTA staff say they’ve learned some lessons from planning Van Ness BRT that should help them stay on track to meet their new target of completing the line in 2019. What’s caused so much delay? Opponents in the Richmond have fought the project, citing the loss of car parking, fears of construction hurting business, car traffic diverted to side streets, and the cost ($180 to $220 million, compared to the estimated $2.5 billion for surface-only light rail, or $5 billion to put it underground downtown [PDF]). SFCTA staff also say work on Van Ness BRT has taken time away from the Geary project. Just like Van Ness, Geary has three major design options (plus a “no build” option, a.k.a. Alternative 1) that are being evaluated in the environmental impact report: Bus lanes running alongside the parking lanes (Alternative 2), center-running lanes in between a set of dual medians (Alternative 3), and center-running lanes alongside a single center median (Alternative 4). 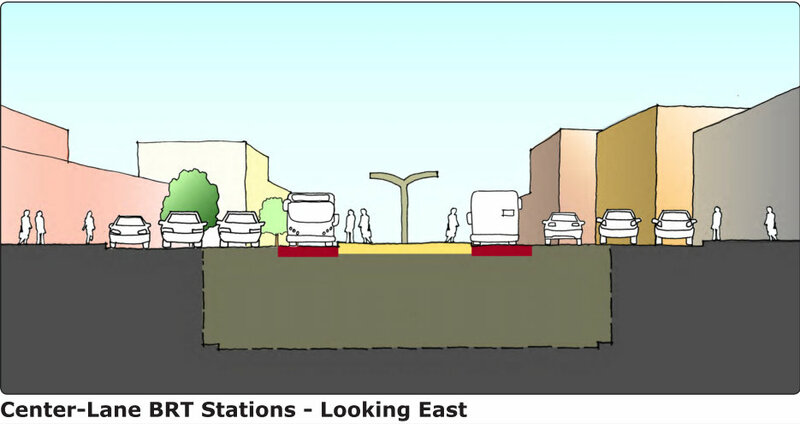 Each of those could be mixed-and-matched with options for special junctions, including filling in the Fillmore underpass and a Masonic intersection with a bike lane “jog” connecting parallel bike routes. Advocates and planners are pushing for the center-running options, since separated center lanes are crucial to maximizing the speed and reliability of BRT routes. Members of the SF Transit Riders Union (SFTRU) said they support either of the two, as long as the bus lanes are fully separated from cars. Both could satisfy planners’ goal of designing the project to be “rail-ready,” meaning the street would be configured to easily accommodate rail, in case the city decides to install it in the future. A hybrid design combining the two center-running options was chosen for Van Ness, but Geary might not need such a compromise. A major difference with Geary is that, unlike Van Ness, electric trolley buses don’t run on it, said Fung, so the center median option is more feasible. That’s because buses with left-side doors, which are needed to board at a center median, exist in motor coach form, but not in electric form. That issue killed the center median option on Van Ness. Steep grades also pose some complications along Geary, said Fung. If BRT is ever converted to light rail, he said trains may not be able to traverse the hills without major engineering work. More pertinent to the BRT project, boarding stations can’t be built on the Fillmore underpass largely because it lacks a flat surface, said Fung. 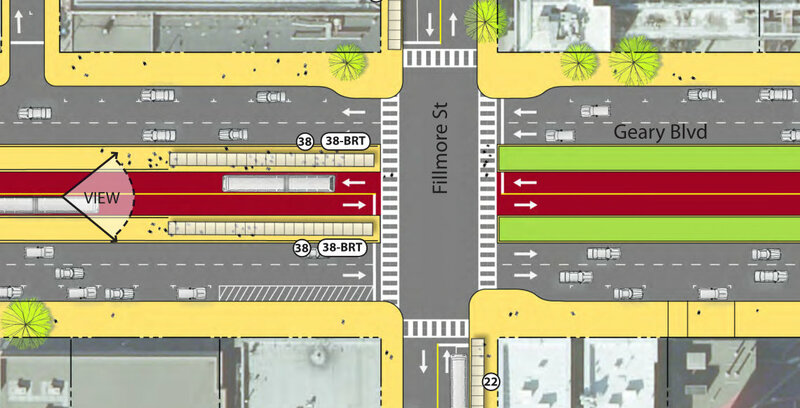 The only solution to make a center BRT station at Fillmore feasible, then, is to fill in the underpass and re-connect Geary and Fillmore at the same grade. The idea of a Fillmore fill-in, which would cost $40-$50 million, is strongly supported by residents since it would help reconnect the neighborhoods severed by the Geary expressway, planners said. In fact, SFCTA Deputy Director of Planning Tilly Chang said D5 Supervisor Christina Olague won’t accept the Geary BRT project without a fill-in. Without a Fillmore fill-in, buses would have to weave from center lanes to the local mixed-traffic side lanes, which they use now. That subjects buses to blockages from car traffic and delivery trucks. The Masonic-Presidio tunnel is less complicated. Boarding stations are proposed for either end of the tunnel, and passengers would connect to the upper deck via stairs and elevators. Under Alternative 2, the non-center-running option, buses would continue using the local side lanes as they currently do. Under either of the center-running alternatives, eastbound car access in the tunnel would be closed, with drivers diverted onto the two upper lanes. On the upper section of Geary, where it intersects Masonic and Presidio, planners are proposing a bike lane “jog” (a series of turns) to connect bike routes on parallel streets. Although the SF Bicycle Coalition had previously pushed for bike lanes on Geary, it was met with resistance from the SFCTA due to the loss of parking or traffic lanes they would replace, and SFBC Deputy Director Kit Hodge said the organization is now on board with a new compromise. While it may not meet the 8-to-80 standard, the bike lane jog would connect the proposed east-west route along Anza to Post (Anza turns into one-way O’Farrell when it hits Masonic) by guiding riders onto Masonic for one block, upper Geary for one block, and Presidio for another block to link to Post. North-south bicyclists using the raised bike lanes planned for Masonic from Geary to Fell Street could also use the jog to continue along Presidio. On the downtown section east of Gough Street, where the 38 splits onto separate one-way streets, the existing bus lanes may be made more visible to keep drivers from blocking them, traffic lanes could be removed for sidewalk widenings, and bus shelters upgraded. SFTRU members said they’d like to see “a more robust” improvement plan for separating the bus lanes from car traffic than what they’ve heard. On the other outer Richmond end, Fung said bus lanes may end at either 25th or 33rd Avenue, since traffic and ridership levels tend to drop so low. Ending them at 25th Avenue may reduce the project’s cost and keep more parking spaces, which may help assuage complaints about parking loss. It’s unclear if opposition to the project from Richmond merchants has been quelled at all, but there weren’t noticeable signs of it at Monday’s community meeting at the Richmond Rec Center. SFCTA staff said they’re looking at mitigating parking loss by creating new spots on side streets. Mario Tanev and Brett Thomas of the SFTRU pointed out that merchants might be sold on the project’s benefits to businesses using some demographic data. As Streetsblog has reported, San Francisco merchants who resist losing car parking often overestimate how many of their customers drive and underestimate how much non-drivers spend at their stores. And when Tanev and Thomas compared SFMTA ridership surveys [PDF] with U.S. census data, they found that income levels among Muni riders are mostly representative of SF’s general population. That kind of empirical evidence, they said, could help make the case to Geary merchants that BRT is good for business. The SFCTA plans to release its draft environmental impact report some time in 2013 and finalize it in 2014. According to the current schedule, construction would start in 2017, and Geary BRT would open in 2019. I don’t see any bike lanes in any of the renderings? They’re the green lanes on the Masonic intersection rendering. It’ll be hard to wait until 2019, but I’m a big believer in BRT in general and on Geary in specific. I’ve seen the results Cleveland has enjoyed and am glad SF is giving it a try. I live just a couple blocks from Geary, and would definitely get out to the Richmond more if the 38 wasn’t such a terrible experience. Thank you for your very thorough and informative piece, describing what sounds like a good project, with Alternative 3 or maybe 4 looking best. I hope it will be built because Muni riders need such large scale improvements. As the article points out, the bike lane design along Geary between Masonic and Presidio, isn’t for the 8 to 80 crowd. It seems like this is a spot where it’s worth the extra effort to design and build a cycletrack. Masonic will be serving the 8 to 80 crowd (indeed, bike infrastructure from the Wiggle and from Golden Gate Park all the way to Geary will be designed for the 8 to 80 crowd; why stop at Geary where there is plenty of real estate to accomodate a cycletrack?). It’s important to ensure that projects like the Masonic cycletrack succeed. Kids will use it to access the nearby JCC after school, but if they’re forced to ride in the middle of Geary, that’s probably more than they or their parents are comfortable with. Filling in that monstrosity would go along way towards making the Geary/Fillmore area friendly for pedestrians and bicycles. Any plans to allow GGT’s commuter Route 92 use the lanes? It’s the only line that runs along Geary and is definitely limited-stop, so it wouldn’t clog up the system. And why not restore the train tracks? To “Muni’s first streetcar line”? Buses could run in the same lanes, of course, but it would allow for more efficient trunk operation. Oh right. It’s SF Muni. Doing it sensibly is not an option. Well, at least they’re trying to make it “rail ready”. I don’t see how the Fillmore Fill-In can possibly cost $40 million, though. It’s *dirt moving*! It’s more expensive to build train tracks. So I think BRT qualifies as a sensible option given that funding is hard to find. Nice and thorough article. I was also at the meeting on Monday, and was thrilled to be part of the process including leaving comments, which they seem to take seriously. I recommend to anyone interested in Geary BRT to leave comments. They really do base their decisions based on community input, and if we don’t participate (or let others drown out our wishes with their overwhelming participation), we’ll end up with a lackluster project. I believe they will accept comments online: http://www.sfcta.org/mos/Contact_Us/task,view/contact_id,23. The project will require union labor with a proviso that a certain number of jobs will go to local residents. Some contracts will need to go to minority and women owned businesses. when it gets to 40 Million, the money isn’t landing in the hands of the laborers, despite the protestations of the people actually making the money that the Unions are making all the money. Historical note: Before Masonic was extended north of Geary in the 1940’s, there was a one-block street called Josephine Street that was between the Muni car barn and the storage facility that ran parallel to Emerson Street. I’m not sure how filling in the Fillmore underpass serves to reconnect the neighborhoods. As a pedestrian, walking across Geary on Fillmore is reasonably pleasant: you cross two separate 25 foot streets, and walk 85 feet along the sidewalk on the bridge. Far better than walking 450 feet up and down overpass ramps, or 130 feet of crosswalk interrupted only by a tiny median. Heck, add some bulbouts to reduce the width of those two side-streets to 10-15 feet. It seems to me that the ideal solution for Fillmore would be to raise the center BRT lanes to the surface while leaving the other four lanes going under. Have the stations on the bridge. I think this would be great for passengers– all the advantages of boarding on the surface, but not having to deal with Geary car traffic. I’d like to also see the decking extended a few dozen feet east and west, if possible, both to provide space for the bus platforms, and simply to reduce the impact of the cars below. I’m not sure how feasible this is, though I think it would not have to be quite as thick, as it wouldn’t have to support heavy vehicles. Even if this were not possible, however, it seems to me that it wouldn’t be much of a problem for the buses to block north-south traffic as they stop to load & unload passengers on the bridge. The option you describe was in the preliminary study, I expect it got eliminated for reasons of cost. Personally I would prefer to see the whole intersection filled in. Instead of crossing two 25′ streets and an 85′ walkway with cars rushing below you, it will be like crossing three 25′ streets, but without the rushing car traffic below. A fair trade-off, but the thing that sells me on this plan is the much wider sidewalks on Geary itself, which will hopefully activate the street edge and create opportunities for pedestrian orientated businesses to spring up rather than the blank walls and parking garages that are there today. The one pedestrian orientated business that’s at that intersection today- The Fillmore- regularly has crowds spill out onto the street because the sidewalk just isn’t big enough to take all the people at the shows. This project should be about making Geary a pleasant street to be on just as much as speeding up the buses. Oh, and all the others members of the “City family” will be getting their cut. The SFPD will have an officer assigned to traffic duty at the project site for the duration, paying him $100K to stand around. And god forbid that a chicken bone or a pottery shard is uncovered. That will shut down the project until a historian can thoroughly document the trash pile of the 49er or Ohlone Indian who happened to live there. They’ve been saying “rail-ready” all along, since that’s what many people actually want. If I’m reading this correctly, though, the fill-in is doing the opposite. Yes, rail is more more expensive in the short term, especially as the cost of maintaining roads is off on some other ledger. But hey, we can always enact yet another bond measure to pay for that. It would be more thorough if “speed up trips” was quantified. As I recall, that number was pretty uninspiring when last estimated. It is making it rail-ready. Rail platforms need to be flat, and the underpass is pretty curvy. The Fillmore underpass has pumping stations to keep the area from flooding during heavy rains, and PUC sewer equipment serving portions of Japanton and the Fillmore. What baffles me is the $180-$240 million price tag associated with building a BRT station in the Geary tunnel at Masonic. does by car, according to SFCTA project leader Chester Fung.” This cannot be accurate. Where does Chester Fung get these statistics from? I say it is easily 3:1 cars with people. Bottom line is, you are removing 1/3 of the traffic lanes from the Expressway. WOW! Is it really smart to remove 33% of traffic lanes from the longest street/espressway/freeway in SF? The question you fail to ask is, should standard traffic speed be 40+ MPH? I think you don’t ask this because you know the answer is a resounding NO. What’s your point, mikesonn? My point is, if the traffic is going the posted speed limit, it would be easier for buses to pull back into traffic and thus make the trip quicker from point A to point B. If the issue is time it takes the buses to make their trip, why not extend the green light times on Geary? They built out a BRT system and are now replacing it with an LRT system, at very high cost: despite the allure of the BRT being an inexpensive precursor to easily implementing LRT later. The problem with the bike lines on Post, aside from the number of trucks parking in them, is that there are so many cars making right turns to get to the medical offices on the first few blocks when heading towards downtown. It seems to cost $100,000,000 more to run Geary BRT with side boarding platforms over center platforms because of the extra cost of redoing the existing median and building a new median. A total cost of over $300,000,000 might doom this important project. A good way to have center platforms without buying special buses with doors on both sides is to run the buses in counterflow so that buses with doors on the right side can stop at a center platform. a signal arm over Sloat for pedestrian safety purposes which could be done over Geary and TEP is proposing signal jumping for buses which would also help buses shift to and from counterflow. Moving the Express buses on and off BRT will also take some signals. The other advantage of counterflow is that it doubles the numbers riders using the underground stations at Masonic and Fillmore which improves rider safety while reducing the cost of stairs and elevators for these stations. Notice the use of the word station, like for a subway. When I last spoke with Chester Fung keeping the tunnel at Fillmore cost more than filling it in: now filling it in costs more.We should run the buses in the tunnel and maximize BRT. This would a fantastic correction of the 1960s stupidity of building too many garages and then building highways so that people could drive to the garages. There are more people traveling by bus than car in this corridor. inadequate subways are needed not defended Ed Lee plea derail mass trasit!